Konstantino pendant/enhancer from the Sterling Silver Classics Collection. Konstantino Dare Maltese cross pendant. Sterling silver with hand-etched detail and Greek lettering. Domed; 1 1/4" square . Handmade in Greece. 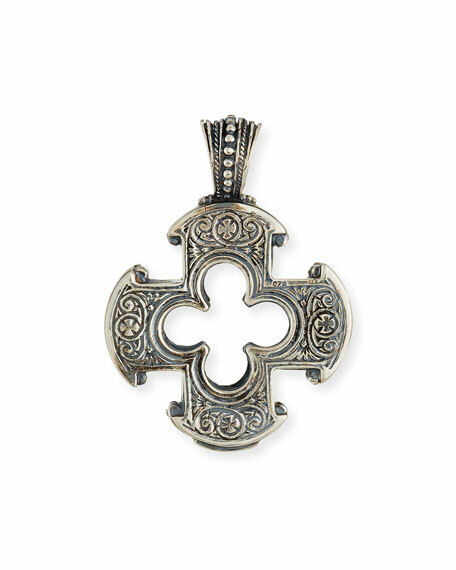 Konstantino cross pendant from the Stavros Collection. 360 degrees of design. Intricately etched sterling silver. 18-karat gold trim. Black onyx inset. Approx. 2.06"L x 0.5"W. Handcrafted in Greece. Please note: Necklace not included.